Congratulations to the Winning Entry! Win a $1000 Sofa or Living Room Furniture Makeover! This is not just an ugly sofa contest! Yes you may post a perfectly good sofa or living room but still need a new sofa or living room for your own reasons! 2. 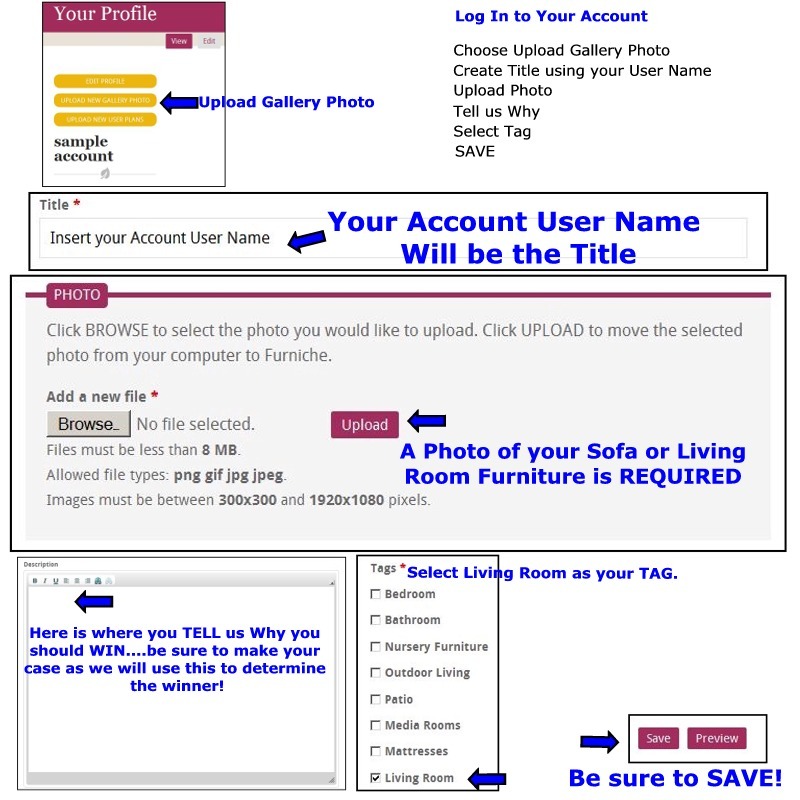 Log into your Account and upload a gallery photo of your Sofa/Living Room Furniture. 3. Tell why you deserve to win a new sofa/living room makeover. Invite your friends to register and comment on your entry! Share the URL with your friends via social media. See an example here. By Registering you agree to the contest terms and conditons. Do you need to find a furniture store in your area? Click here to find a furniture store. Be sure to use our site to learn about furniture shopping before, during and after the shopping process. Contest is open to all legal residents of the United States of America. Must be age 21 years and older. Any individuals (including but not limited to employees, consultants, independent contractors) who have, within the past six months, performed services for Furniche, and immediate family and household members of such individuals, are not eligible to enter or play. "Immediate family members" shall mean parents, step-parents, children, step-children, siblings, step-siblings, or spouses. "Household members" shall mean people who share the same residence at least three months a year. People or other household members who have won any other prizes from Furniche within 120 days of entry are not eligible to enter this contest. Any person who has won $500 or more within the last 6 months from Furniche is ineligible to enter or win. All prizes must be claimed within 30 days of winning or they may be forfeited. One prize per person for the duration of the contest. Contest ends February 8, 2015 at 11:59PM EST. Individual must create an account with Furniche.com and post a photo of a sofa or living room furniture along with a description explaining why the individual entry should be considered as the winner. to qualify. Furniche is not responsible for inability of potential registrants to complete the entry process accurately. Entry may also be completed by mail to: Furniche.com 3435 Thousand Oaks Drive Unit 109 San Antonio, Texas 78247. Include a photo of the sofa or living room furniture, written description why it should be considered as the winner along with entrants contact information. Mailed entries will be verified for eligibility prior to being entered in the contest. Furniche is not responsible for failed, partial or garbled computer submissions, or for technical failures of any kind, including but not limited to electronic malfunction or damage of any network, hardware or software. If for any reason the contest is not capable of running as planned, including infection by computer virus, bugs, tampering, unauthorized intervention, fraud, technical failures, or other causes that corrupt or affect the administration, security, fairness, integrity or proper conduct of the contest, Furniche reserves the right, in its sole discretion, to disqualify any individual who tampers with the entry process, and to cancel, terminate, modify or suspend the contest. No responsibility is assumed for: any error, omission, interruption, deletion, defect, delay in operation or transmission, communications line failure, theft or destruction or unauthorized access to, or alteration of, entries; or any problems or technical malfunctions of any telephone network or lines, computer online systems, servers, providers, computer equipment, or software; or failure of any e-mail or electronic entry to be received on account of technical problems or traffic congestion on the Internet or at any Web-site, or any combination thereof, including any injury or damage to entrant's or any other person's computer related to or resulting from participation in or downloading any materials from this contest. In the event of a dispute over an electronic entry, prize will be awarded to the owner of the e-mail account, not the name on the entry form. The winner will be chosen at the sole discretion of Furniche.com. Comments by other registered users may be considered in the final determination. Federal, state and local taxes are the sole responsibility of the winner, who will receive an IRS Form 1099 reflecting the final actual value of any prize valued at $600 or more. If shipping is required, shipping charges are also the sole responsibility of the winner. Winners are not entitled to exchange or transfer prizes or to obtain cash or other substitutes, but Furniche in its sole discretion may substitute prizes of equal or greater value. Prize is subject to availability. Furniche is not responsible for cancellation or preemption of event or for other circumstances that make it impractical or impossible to fulfill this element of the prize. This element of the prize has no approximate retail value, and if it becomes impractical or impossible to fulfill this element, Furniche’ only obligation will be to provide the remainder, if any, of prize. If there are contest-or specific-rules, those rules will supersede these rules. By participating, entrants agree to be bound by these official rules and the decisions of Furniche and the contest administrator, which shall be final in all respects. By participating in a contest and/or accepting any prize that they may win, entrants agree to release Furniche, its parent, subsidiary, affiliated and successor companies, advertising and promotion agencies and prize suppliers, and each of its respective officers, directors, agents, representatives and employees, as well as each of its respective successors, representatives and assigns (collectively, the "Released Parties") from any and all actions, claims, injury, loss or damage arising in any manner, directly or indirectly, from participation in this contest and/or acceptance or use of the prize. Entrants authorize the Released Parties to send them promotional email materials, and to use their name, voice, likeness, biographical data, city and state of residence and entry materials in programming or promotional material, in any media now known or hereafter created or conceived, worldwide in perpetuity, or on a winner's list, if applicable, without further compensation unless prohibited by law. Furniche is not obligated to use any of the above mentioned information or materials, but may do so and may edit such information or materials, at Furniche’ sole discretion, without further obligation or compensation. By submitting entry materials, entrants certify that such materials are original and created by entrant, that entrants have the necessary rights, permission and authority to submit such materials, and, if applicable, that entrants maintain a valid copyright in the materials. Entrants acknowledge that such materials may be included and/or discussed in a broadcast, that such discussion may include statements or opinions by the broadcast talent or others about the entrants, the entrants' appearances and/or the materials, and that those statements and opinions may be considered surprising, humiliating, embarrassing, derogatory, defamatory or otherwise offensive or injurious to them, Sponsor's employees, its studio or at-home audience and/or other third parties. Entrants release the Released Parties from any actions, claims, injury, loss or damage allegedly caused, directly or indirectly, by any such statements or opinions made during a broadcast. By participating in a contest and/or accepting any prize that they may win, entrants agree to release Facebook. Upon entering the contest, entrants are providing information to Furniche, and not to Facebook. Furthermore, entrants’ acknowledge that the promotion is in no way sponsored, endorsed or administered by, or associated with, Facebook. I only have two chairs in my living room! I could use a sofa so much. I would love to have company over, but they have no where to sit. Thank you so much for the chance. 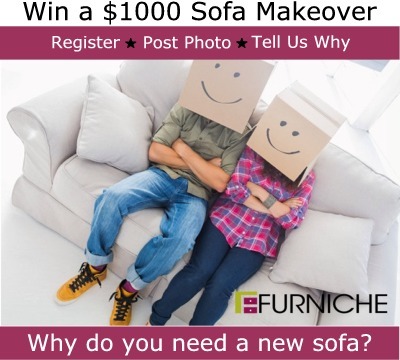 Fyi...once you register on Furniche, to enter the contest you must post a picture of your living room or sofa. Simply log in to your account and post the picture. Click here to see how to post your picture. Best of luck to all who enter. Remember that your comments and comments by others will be considered by Furniche when selecting the winner. I need a mom cave! I need an area to escape and relax. A living room mom cave. Inviting, classy, comfy, and girly. Three kids, three jobs, and two kids. We had to make a quick move after selling our furnished home. We bought a mobile home and have Salvation Army furniture in it. The couch is a pull-out bed, which we don't use, however the springs have filed and sitting on the couch feels like sitting on a bed of stones. The couch also has fleas and we have done our best to rid it of them but it would appear that the couch was donated to the Salvation Army with pet-enemies included. All-in-all, we need a comfortable, attractive sofa/couch that can be used as a second bed. An armchair would be wonderful. One that I can lean back in and read or watch TV - not that we have a TV in our living room yet, but we will in time. Thank you. I am not certain if this is where I am to put my comments about why I need a new couch but here's hoping. We are transforming an old church to our private residence, and as my picture illustrates, we have no furniture to date. I miss having my family come over just to "hang out" with us and furniture would surely make that possible. Thank you for the opportunity to win some much-needed furniture. Here is the image we used on Facebook to start our contest. I would love to have a new couch and to win that would be awesome news. A new COUCH would make our decision to start a family easier! im very confused but i will tell you that i need new living room furniture due to the fact mine is probably like 20 years old and looks like it belongs in my grandmas basement its so plaid and blah! i would love an update and anew outlook for 2015 and be a hip mom in stead of a pre historic nerd mom!!! Thank you so much for the chance and the oportunity to get with the times so my teenage kids dont have to be embarrassed when their freinds come over! I could really use a makeover for my living room. I have abig family and ots of visitors, not to mention 2 little ones under the age of one who have a play pin n basinet in the living room cause they are of ocurse, family (and want to be all in the mix, lol!)! .. But seriously, we need better arrangement living in a trailer and we have just taken whatever we can get from family when we moved. (recenlty moved under 6 months). I would love to surprise everyone, living there and visiting, one day with a brand new look!